PCSchool incorporates an early notification and general messaging system that uses innovative technology to communicate with students, parents and staff. 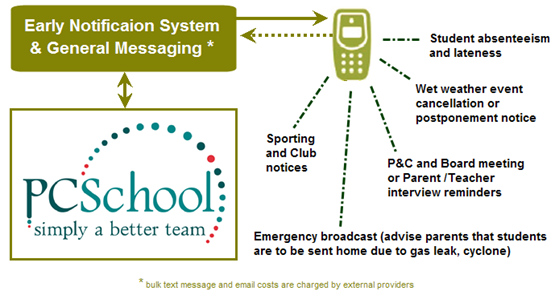 The Early Notification System’s integration of a messaging service through texting and/or email via PCSchool drastically reduces the time it takes for schools to successfully contact parents. It makes it possible for schools with large numbers of unexplained absences to consistently notify all parents immediately and receive responses that same day. PCSchool uses a bulk messaging web-based service which enables schools to send parents, students or staff text or email messages. Messages are very cost effective and can be sent a zero cost to the school.